David Emler holds a Joint Degree (cotutelle) Ph.D. in Contemporary History and Political Science from Charles University in Prague and Paris West University Nanterre La Défense. He also holds Master’s degree (PhDr. and Mgr.) in West European Studies and Bachelor’s degree (Bc.) in Area Studies from Charles University in Prague. He studied two semesters at Sciences Po, Paris and one semester at New Sorbonne University, Paris 3. 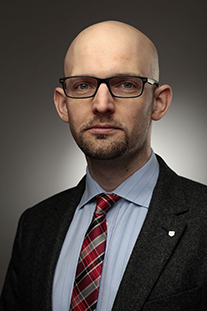 Full-time assistant professor and research fellow at the Institute of International Studies, Faculty of Social Sciences, Charles University in Prague since 2009, David Emler also worked at the International Department of the Czech Press Agency and at the Protocol Department of the Government of the Czech Republic. Emler, David. “Francouzská historiografie soudobých dějin.“ [“French Historiography of Contemporary History.”] In: Napříč kontinentem soudobých dějin. Evropská historiografie po konci studené války, ed. Jiří Pešek et al., 16–53. Prague: Argo, 2013. Filipová, Lucie and Emler, David. “Německý historický ústav v Paříži.“ [“German Historical Institute in Paris.”] In: Věda a politika. Německé společenskovědní ústavy v zahraničí (1880–2010), eds. Jiří Pešek, Lucie Filipová et al., 99–131. Prague: Karolinum, 2013. Emler, David. “Dějiny a paměť v knize Paula Ricœura La mémoire, l’histoire, l’oubli.“ [“History and Memory in Paul Ricœur’s book Memory, History, Forgetting.”] In: Vybrané metodologické problémy mezinárodních teritoriálních studií, ed. Barbora Skálová et al., 9–17. Prague: Matfyzpress, 2011. Emler, David. “Počátky evropské integrace 1945–1949.“ [“Beginnings of European Integration 1945–1949.”] In: Juvenilia Territorialia I., ed. Jiří Pešek, 251–280. Prague: Charles University, 2006. Emler, David. “Využívání paměti v projevech francouzských prezidentů Chiraka a Sarkozyho.“ [“Uses of Memory in the Political Statements of the French Presidents Chirac and Sarkozy.”] In: Český časopis historický 111, No. 2 (2013): 335–354. Emler, David. “Francouzské ‘zákony paměti‘.“ [“French ‘Memory Laws’.”] In: Acta Universitatis Carolinae. Studia Territorialia X, No. 1 (2010): 9–28. Emler, David. “Přijetí knihy La France de Vichy Roberta Paxtona francouzským tiskem a francouzskou historickou komunitou.“ [“Reception of Robert Paxton’s Book Vichy France by French Press and French Historical Community.”] In: Acta Universitatis Carolinae. Studia Territorialia – Supplementum I, No. 2 (2010): 121–199. From 2012: Junior member of “Centrum pro výzkum kolektivní paměti” (UNCE) [“Center for Collective Memory Research”], Charles University in Prague. 2010 – 2012: Member of research team „Dnešní evropská krajina výzkumu soudobých dějin” [“Today’s European Landscape of Contemporary History Research”], Grant Agency of the Czech Republic. 2008 – 2010: Main researcher “Využívání minulosti v politickém diskursu ve Francii od 90. let 20. st. do současnosti” [“Uses of the Past in Political Discourse in France since 1990s to the Present”], Grant Agency of the Charles University in Prague. 2007/2008 – “Jeune chercheur francophone“ [“Young French-speaking Researcher”] scholarship, Centre français de recherche en sciences sociales (CEFRES), Prague.